Following their 16th Anniversary pay-per-view, Ring of Honor was back at Sam's Town Live in Las Vegas for a second straight night on Saturday as they filmed their next set of television episodes. 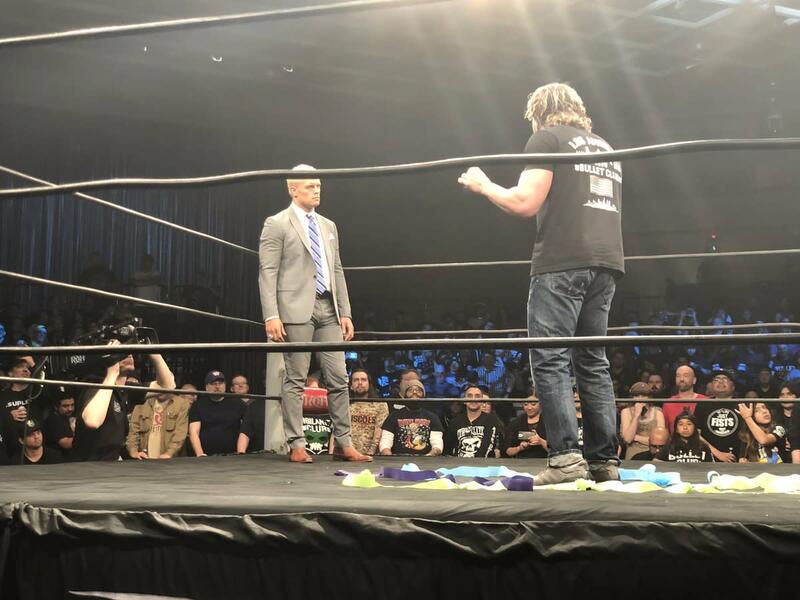 Kenny Omega appeared and continued his feud with Cody Rhodes, more matches were announced for Supercard of Honor XII, and three Women of Honor Championship tournament quarterfinal matches took place. - The Kingdom opened the tapings with a promo about ROH's conspiracy against them. Klein used a choke to advance. - Kenny King and Silas Young brawled, with it being announced that they'll have a last man standing match at Supercard of Honor for King's Television title. Christopher Daniels and Frankie Kazarian came out to attack Gordon, but The Young Bucks made the save. The Bucks and Gordon then shook hands and hugged. - It had been announced that The Kingdom would be challenging for SoCal Uncensored's Six-Man Tag Team titles at Supercard of Honor, but Bully Ray removed them from the match. He announced that it will be SoCal Uncensored vs. The Young Bucks & Gordon in a ladder match. Sakai will face Tenille Dashwood in the semifinals. The Briscoes won after Silas Young distracted King. The Dawgs (Rhett Titus & Will Ferrara) interfered and attacked both. It will be Iwatani vs. Kelly Klein in the semifinals. - Cody Rhodes and Kenny Omega came out for a promo, which ended in a brawl. Cody shoved Matt Jackson into Omega and The Young Bucks and Omega teased like they were going to fight. Martinez hit a chokeslam to win. Cody hit the Cross Rhodes on Daniels, but Taven stole the pin from him. "Bernard the Business Bear" was ringside with Cody after Omega was revealed as being in the "Bury the Bear" costume the night before. The Bucks won with the Meltzer Driver and will get a future Tag Team title shot. Motor City Machine Guns, Beer City Bruiser & Brian Milonas, The Dawgs (Rhett Titus & Will Ferrara), and Coast 2 Coast were also in the match. Shaheem Ali was alone for Coast 2 Coast due to Leon St. Giovanni getting attacked backstage.